The Li Phi Waterfall, also called Somphamit Waterfall, is one of the highlights of the 4,000 islands. The impressive falls are accessed through the western coast of Don Khon. 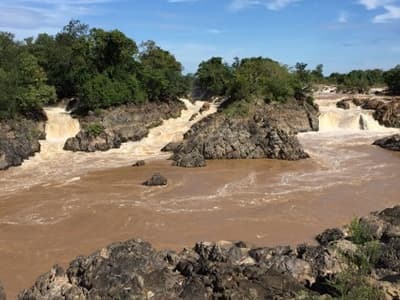 The roaring rapids were squeezed by a branch of the Mekong River between the island of Don La and Do Siniat, and the flood blew on huge boulders. That’s a good idea to peel you out of the hammock, and you will be reminded by someone that the position on the southern tip of the isle, meaning you could catch both a great sunrise and sunset. In additions, Li Phi Waterfall or Devil Corridor is one of the most beautiful waterfalls in Laos. You will have opportunity to enjoy swimming, sun baking on the sandy beach and watching the rare Irrawaddy Dolphins. That would be a unique attraction!! The Irrawaddy dolphins called “Pla Kha” in Lao and inhabit only this place of Mekong River. They are not scared of people but frolic around when they see people. You can charter a boat to observe the endangered freshwater dolphins.